With the extensive roadwork taking place on many Quebec streets, the signage is all that allows the driver to be surprisingly taken on a detour route and ultimately arrive (albeit probably late) to his or her destination. Similarly, inside the Montreal Courthouse, while it is no longer under construction, it remains a building which is particularly difficult to navigate, and one where the consequences of not arriving at a hearing in a courtroom on time could be drastic. The signs, noticeboards, and papers affixed to different doors throughout the building are how a person is directed to their destination within this labyrinth. What is surprising is that despite the fact that people have the right to a trial in either English or French, all the signage in the courthouse ensuring people find the right courtroom are exclusively in French. Both the Canadian Charter of Rights and Freedoms and the Charter of the French Language (Bill 101) establish that trials in Quebec may be conducted in either English or French. Section 19(1) of the Canadian Charter contains the following: “Either English or French may be used by any person in, or in any pleading in or process issuing from, any court established by Parliament.” According to section 96 of the Canadian Constitution (1867), the judges of Quebec Superior Court are appointed by the federal government, meaning that this Court falls under the protection of section 19(1) of the Canadian Charter. 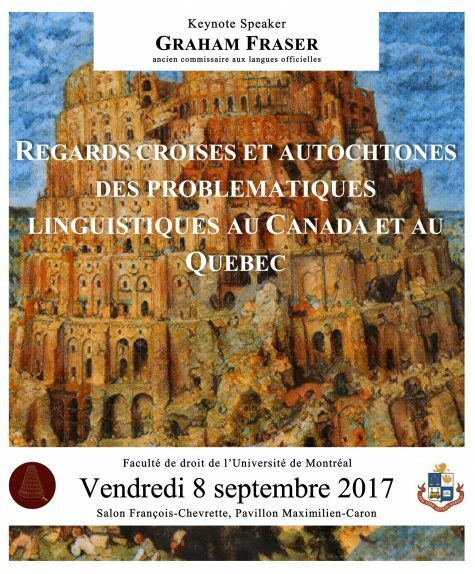 Section 7(4) of the Charter of the French Language contains the following: “[E]ither French or English may be used by any person in, or in any pleading in or process issuing from, any court of Québec.” These protections are a testament to the progression of language rights in Canada over the past half century. The judicial district of Montreal has the honour of being the most populous judicial district in all of Canada, serving slightly less than two million inhabitants. An important percentage of these individuals are mother-tongue English speakers with varying degrees of proficiency in French, as well as allophones who are more comfortable in English than in French. These are the individuals who would most likely have their trials or proceedings completed in English, but who do not benefit from English-language signage in the courthouse. Becoming aware of this situation, I decided to write to the Quebec Minister of Justice, Stéphanie Vallée, regarding the unilingual French signage found in the Montreal Courthouse in March of 2015. The following May, Me. Gaétan Rancourt, Director of the Centre for Customer Service of the Montreal Courthouse, responded to the letter. This response excludes the fact that the third paragraph of section 22 of the Charter of the French Language allows for signs in French and other languages in the following: “The Government may, however, determine by regulation the cases, conditions or circumstances in which the civil administration may use French and another language in signs and posters.” This provision could be used to facilitate the physical access to justice of non-French speakers in Montreal and the rest of Quebec. Finally, this response indicates that although people may have their trials conducted in either English or French, it is up to them to navigate the courthouse using French-only signs or to seek help from courthouse employees to point them in the right direction. No further help is planned to assist them. This is a perfect example of how politics and language rights clash, with justice being the true victim. This content has been updated on 15 January 2017 at 19 h 55 min.